Consecutive interpretation is a mode of interpretation where the speaker pauses while speaking to allow the interpreter to convey the message into the target languages. Among many other settings, this type of interpretation is generally used for smaller gatherings, depositions, immigration proceedings, medical appointments, facility tours, business meetings, trainings, and interviews. Our consecutive interpreters maintain strict standards of professionalism and possess exceptional linguistic and interpersonal skills to help facilitate communication..
We have consecutive interpreters for all languages we offer and for any industry. Please contact us today or request a free quote to discuss your specific requirements. 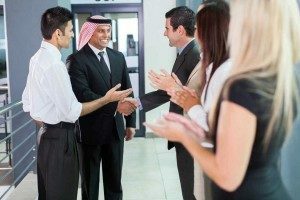 Whether you’re training a new employee or hosting international delegates, your company’s image and reputation are at stake. Hiring a certified consecutive interpreter helps avoid the liability and embarrassment of using a bi-lingual employee or non-native expert for interpretation services. Do you need consecutive interpretation services? Please click here to request a free quote or give us a call at 720-325-0459 or 877-409-6737 if you have any questions. We will be happy to schedule one of our most qualified interpreters for your next event.